In general, there are two different types of error that can occur when making a decision: the first kind ("type 1 errors") are those errors which occur when we reject the null hypothesis although the null hypothesis is true. The second kind ("type 2 errors") of errors arise when we accept the null hypothesis although the alternative hypothesis is true. An example should clarify the situation. Suppose you want to buy ore to produce iron. You decide that the ore has to have a certain minimum concentration of iron to be useful for the process. Since the concentration of iron varies for each delivery, you have to ensure that, on average, you receive more than the specified minimum concentration. In order to be cautious you don't trust your suppliers, assuming they can't fulfill your requirements (H0, or null hypothesis). You will believe them only if they can supply evidence that the reqirements are met (H1, or alternative hypothesis). Due to the uncertainties involved in the process of determining the iron content, there is a risk that your decision is wrong. When you decide to buy a particular batch of the ore, and it turns out that the specifications are not met, you have made a type I error (i.e. rejecting H0 when it is true). There is also the possibility that we accept H0, although it is in fact wrong: we don't buy although the specification is met. That is called type 2 error. Since our decision can be false or true, and the null hypothesis can also be false or true, there are four possible outcomes of a test. The probabilities for a type 1 error and type 2 error are usually denoted by α and β, respectively. Which of the errors is more serious, depends on the damage that is related to it. Type 1 and type 2 errors are related to each other. Increasing the type 1 error decreases the type 2 error and vice versa. 1-α is the confidence in the test procedure. 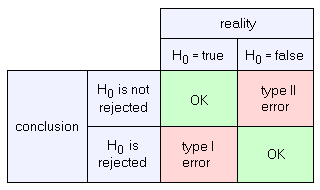 Rejecting a hypothesis is stronger, than accepting a hypothesis, so we reject H0 with an error probability of α or there is not sufficient evidence for the rejection of H0, but we do not accept H0 unless β is known.